Ethel M's finest collection of sugar free chocolates in a beautiful wood gift crate. For those seeking sugar-free chocolates, look no further. The chocolatiers at Ethel M have brought together their finest collection of sugar-free and no-sugar-added indulgences and packaged them up as the perfect, premium chocolate gift. 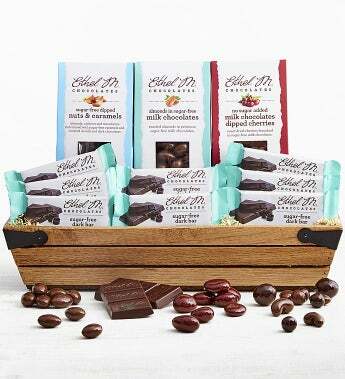 Inside you'll find Sugar Free Nuts & Caramels, Sugar Free Almonds, No Sugar Added Chocolate Dipped Cherries, and eight Sugar Free Dark Chocolate Bars.